Goose Foot Street Furniture is exhibiting at the Education Estates Exhibition at Manchester Central on 18 – 19 October 2016. Education Estates is the only event of its kind in the UK, covering the primary, secondary, further, and higher education sectors. Visitors are responsible for the whole spectrum of education facilities, from village primary schools to major metropolitan universities. Stop by and visit the team on stand D23 where will be showcasing our range of contemporary and bespoke street furniture solutions for the Education sector. This includes seats, benches, bollards and cycle stands as well as bandstands, gazebos, dug out shelters and picnic sets. Please visit the Education Estates website to register for your visitor badge. We look forward to seeing you there! As one of the UK’s leading street furniture manufacturers, we supply high-quality products that are both durable and affordable. We have over 35 years’ experience in the industry, working closely with landscape artists and architects, building contractors and local authorities to custom-build furniture either in batch orders or as one-off bespoke products. The whole manufacturing process takes place at our in-house facility, starting from the initial design stage to the fabrication and powder coating of the end product, so there will never be third party mark-ups on prices. 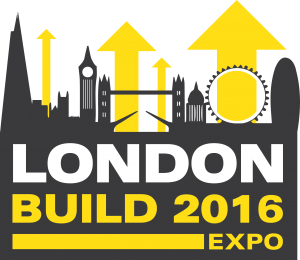 The Goose Foot Street Furniture team will be exhibiting at a series of the Build Expo events across the country during 2016. As the UK construction industry continues to boom, substantial investments are being made in the regeneration of many town and city centres. The International Build Events are the only events of its kind and are a great way to keep up to date with the latest developments in the construction sector. They provide a fantastic networking opportunity with industry peers, as well as the chance to approach senior level executives and international companies. We work closely with landscape artists, architects and regeneration specialists to create and manufacture street furniture products to suit your specifications. 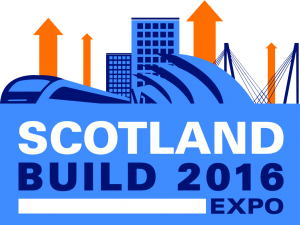 Please stop by our stands at the Build Expo events for a catch up, a drink or to discuss your upcoming regeneration projects! A £4.8 million redevelopment project to restore and enhance 1km of seafront gardens in Felixstowe, UK has been completed. majority of the restoration work, alongside funding from the Local Authority Business Growth Incentive Scheme and Haven Gateway Partnership. Goose Foot Street Furniture were selected by Mott Macdonald to manufacture 6 bespoke seats/chairs of varying sizes and 3 950mm tables to improve the overall aesthetics of the gardens and to create a larger and more attractive networking space. Social inclusion is the pillar of the project, encouraging people to use the gardens as a place to meet and enjoy. We manufactured the mild steel seats, chairs and tables in-house using state of the art laser cutting and fabrication methods. The seats comprise of 4 leg sections & slat supports with pre-drilled holes for fixing the timber. The 3 slat supports were then fitted with armrests and joined with a 42mm central tube and 5mm flat bar top & bottom – fully welded and fabricated, hot dip galvanised and polyester powder coated to RAL 9002. The timber selected was Iroko hardwood. 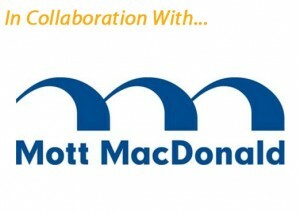 Graham Wood said: “It was an honour to be selected by Mott Macdonald to work on this important project for the town of Felixstowe. We are seeing a significant increase in the number of coastal regeneration projects and continue to work on them closely with contractors and councils across the country. Our design engineers work together with landscape architects and the primary client to ensure that all options are considered and potential issues raised. First Phase of Altrincham Regeneration Complete! The first phase of a £6m public realm improvement project to transform the appearance of Altrincham town centre has been completed. The public realm project led by Altrincham Forward to transform the appearance of Altrincham town centre has converted its vehicle-dominated streets into a pedestrian-friendly environment, encouraging footfall, engagement and dwell time. 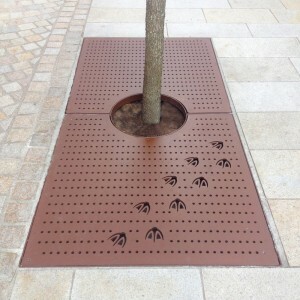 We were selected by landscape architects Planit-IE to produce 25 bespoke tree grilles and 8 contemporary style 2.6m seats for the town centre. Each tree grille was manufactured, powder coated and laser cut in-house. Unique touches to the tree grilles in Goose Green include laser cut geese footprints and the inscription “Altrincham Market Town 1290” elsewhere in the centre. The final tree grilles were cut from 304 Grade Stainless Steel to ensure the smaller lettering as crisp and clear as possible. All eight bespoke seats installed throughout Altrincham town centre were manufactured using hot dip galvanised and powder coated mild steel, incorporating 45mm thick Iroko slats with a half bullnose to the underside. 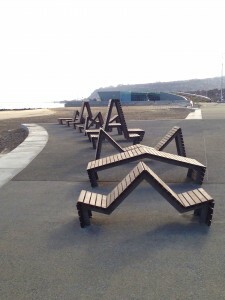 The mixture of benches and seats were spread uniformly across the town centre. 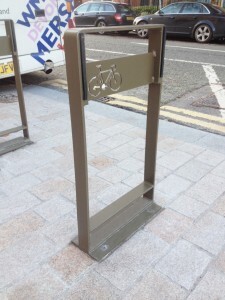 In addition, we supplied 12 bespoke mild steel cycle stands powder coated in 2525 Bronze. The cycle stands feature intricate laser cut designs such as a figure of a bicycle and swirls to fit with the surrounding landscape. 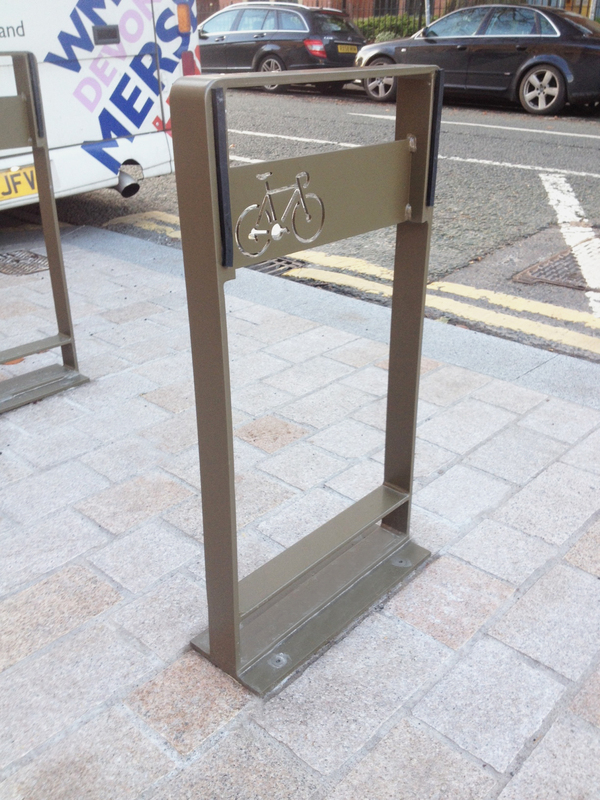 There was a high demand for cycle stands from residents and visitors in Altrincham, and since they have been installed we have received many positive comments. A significant amount of the work we do involves regeneration projects with local councils and products designed by landscape artists and architects. As an original manufacturer, we are able to custom-build street furniture to your specifications, in batch orders or as one-off bespoke products. With more than 30 years’ experience in designing and manufacturing all aspects of street furniture, Goose Foot are recognised as the ‘go-to’ steel fabricator for urban realm work. Goose Foot was selected by Anwyl Homes to work together on the Kingsmill Road development in Wrexham. For this Wales & West Housing project, we provided a range of furniture that is both rugged in design and effective in look and feel. Anwyl chose the Tula range, which includes curved and straight modular seats together with two Goose Foot signature litter bins.The colour coated mild steel street furniture has been purposely engineered to endure all weather conditions and to provide excellent support. Located in the central courtyard at Kingsmill Road, these seats take pride of place and allow for a stronger network of open space. The local residents are delighted with their new facilities and opportunity to mingle in comfort with their neighbours. The seating was designed to mirror the surroundings of the open space and act as a catalyst for local regeneration. Graham Wood, General Manager of Goose Foot, commented on the project: “As one of the fastest growing street furniture manufacturers in the UK, we were delighted to be chosen by Anwyl to supply all the street furniture into this development. Goose Foot was launched in 2014 as a one-stop-shop for street furniture, offering the highest quality products at the most cost effective prices. The design, build, fabrication and powder coating all takes place in-house at Goose Foot’s dedicated manufacturing facility in Darwen, Lancashire, meaning there is never any hidden costs or 3rd party mark-up on prices from the end supplier. By managing the whole process in-house, you can be assured that the final price will be far more competitive than other mainstream suppliers. 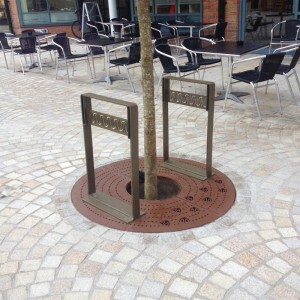 Contact us today to discuss your street furniture requirements! We’re Exhibiting at the Landscape Show 2015! Goose Foot Street Furniture will be exhibiting at the Landscape Show @ Battersea Park, London on 22nd – 23rd September 2015. LANDSCAPE is the essential trade event attracting garden designers, architects, landscape contractors, local authority landscaping professionals, facilities managers and interior designers from across the UK and beyond. You will find us at stand F69, where our team of experts will be available to discuss everything street furniture related for the urban realm, landscaping and regeneration projects. 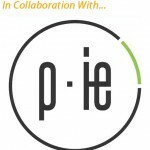 Goose Foot work closely with councils, artists and architects to create unique street furniture products designed to meet your specifications. Stop by our stand for a catch up, a drink or to discuss your requirements! We will be exhibiting next to m-tec, the specialist architectural metalwork division of WEC Group, who will be based at stand F71. We have recently collaborated with m-tec on a number of projects including the Folkestone memorial arch and bespoke benches to accompany it. Whether you’re looking for a stainless steel sculpture manufacturer, canopies or staircases, m-tec will be there to discuss your requirements. 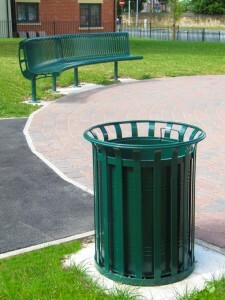 New Street Furniture Products Now Available! Exciting New Street Furniture Products Available at Goose Foot! We are pleased to announce that we have expanded the Goose Foot Street Furniture range and introduced some fantastic new seating concepts. The Tula curved seating range is not only aesthetically pleasing, but it also enhances the functionality of public spaces. The modular design of the curved seats and benches makes it possible to manufacture the seating to any length, suiting your specifications. Both are also available as a circular tree seat/bench. The length and product options essentially make the curved seating a bespoke street furniture solution for any urban project or as a one-off . Both the seats and benches are available as mild steel in a choice of RAL colours or as satin polished stainless steel. 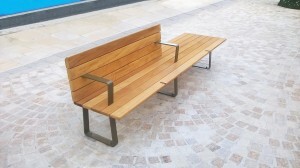 We also recently added the Lander Timber Slatted Seat to our standard street furniture range. Like some of our other timber slatted seats, the Lander features a mild steel frame and hardwood slats made from renewable sources and has been designed for comfort, style and durability. 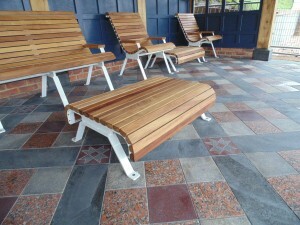 Great for public spaces, the timber slatted seat it is available as 1800mm as standard size or 2000mm optional size. At Goose Foot, we specialise in the manufacture of high quality, bespoke street furniture solutions that suit your specifications. A large amount of the work we do involves regeneration projects with local councils and street furniture products designed by artists and architects. As an original manufacturer, we are able to custom-build furniture solutions to your specifications, in batch orders or as one-off bespoke products. Feel free to contact us to discuss your personal requirements, call us on: +44 (0)1254 700213, or email enquiries@goosefootuk.com and see exactly what we can do for you!